1. Limit sweetened beverages. Research shows replacing even one sugary drink a day with water can lead to a whole host of benefits from prevention of obesity and cardiovascular disease to lower risk of diabetes. Add a spring of herbs like rosemary, thyme or mint into water for festive color and flavor. 2. Rethink the candy craze and help instill skills for lifelong healthy eating. You don’t have to get rid of all the candy, but seriously, do you need to eat 3-5 candy bars worth every day for weeks? Help you kids think about what a healthy diet consists of and make decisions about when, how much and where candy will be eaten. Talk to your kids about moderation. 3. Start trick-or-treat celebrations off right with bellies full of healthy meal. Kids and adults are less likely to over indulge if they have had a full meal before setting out. Make it a great tradition to have friends over, enjoy a pot of chili and salad and then all head out to tick-or-treat together. 4. Want to pass out something, but not candy? Think alternative edibles and non-edibles. Boxes of cranberries, crackers, clementine. Non-edibles: glow sticks, spider rings, bubbles or stickers. 5. You don’t have to keep all that candy! Save it for decorating gingerbread house over the holidays, or put in a birthday piñata. Lots of dentists and health clubs have “buy back” programs kids can take it and drop it off. 6. Move it, move it! Making Halloween healthier is about what you eat, and also about how you move. 7. Serve up fruits and vegetables in fun Halloween themes. 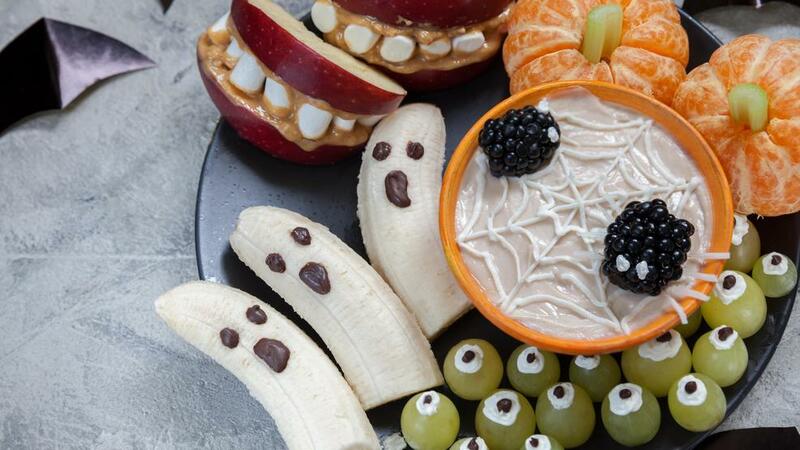 For example, dress up bananas as ghosts, monster apple mouths, “pumpkin” oranges, eye ball grapes. You are only limited by your imagination! Northwest Honda Dealers support preparing kids to live a healthy future. When kids learn how to make delicious things to eat and drink out of natural ingredients, they don’t consume as much sugar and build a strong foundation of knowledge to inform a lifetime of healthy eating. That's why Northwest Honda Dealers proudly support Rootopia, where the art, science and fun of raising happy, healthy kids comes together.